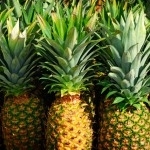 Bromelain is a natural enzyme found in pineapple ( Ananas comosus ). Bromelain is not a single substance, but rather a collection of enzymes and other compounds. It is a mixture of sulfur-containing protein-digesting enzymes—called proteolytic enzymes or proteases—and several other substances in smaller quantities including: peroxidase, acid phosphatase, protease inhibitors, and calcium. it is often used In skin care, following invasive cosmetic procedures. Cosmetic Uses: This ingredient is used principally in skin care applications as an exfoliate. This Bromelain Powder is much higher in GDU. A whopping difference! I have purchased this before, and will definitely do so in the future. Mark B.
PS: I have searched the "web" thoroughly, and you will not find a better quality and price from a trustworthy source. -- what would you get from a foreign country imported product? I put Bromelain Powder in my homemade soap for the exfoliation properties. It help soothe, skin leaving it clean and refreshed. Perfect for sun baked skin that needs some extra TLC. Love this for bath products.